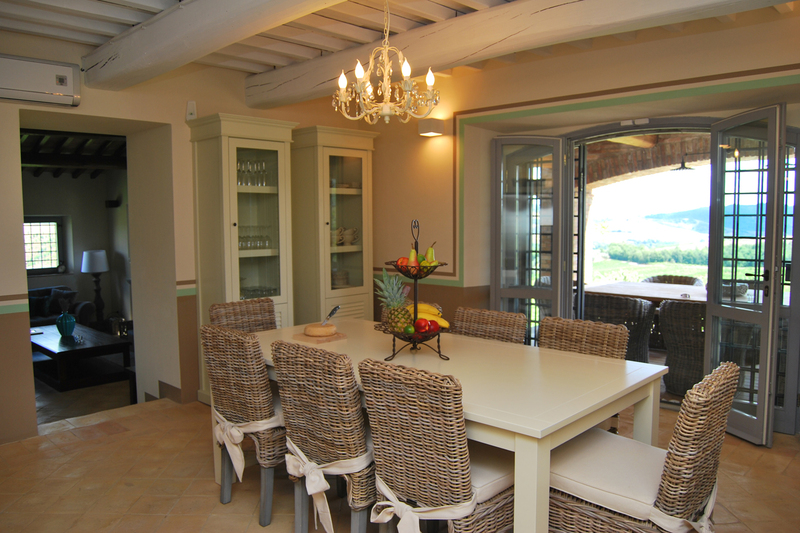 Casale Colline Dolci “breathes” the originality of a beautiful, typical Umbrian landhouse. Yet, it has been fully equipped with all modern facilities and luxury. Discover everything our landhouse has to offer in an instant. Casale Colline Dolci has been restored and decorated with great care and love over the period summer 2008 – spring 2010. Indeed, the final touch of the garden and outdoor facilities was concluded in the spring of 2010. The fine result of the delicate restoration is that the original beauty of the house, the landscape and its views have been completely preserved, while transforming the villa into a perfect combination of tradition and modern comfort. The actual restoration was preceded by months and months of planning, designing, drawing (and re-drawing) and finally selecting what the Belgian friends dreamed of being their ideal escape in Italy. They were assisted by a fine couple of two architects (a perfect Italian/Belgian mix: Fernanda Salvatori and Michael Van Impe), who called upon the help of skilled, local craftsmen to make the dream come true. The result is amazing! 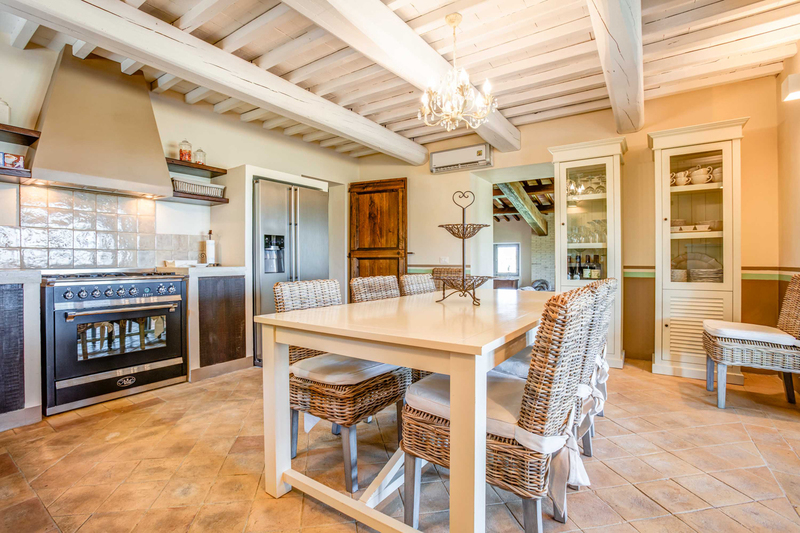 The house has been restored in its original Tuscan/Umbrian beauty with original stones and other typical materials like chestnut beams, terracotta bricks and traditional wooden doors. 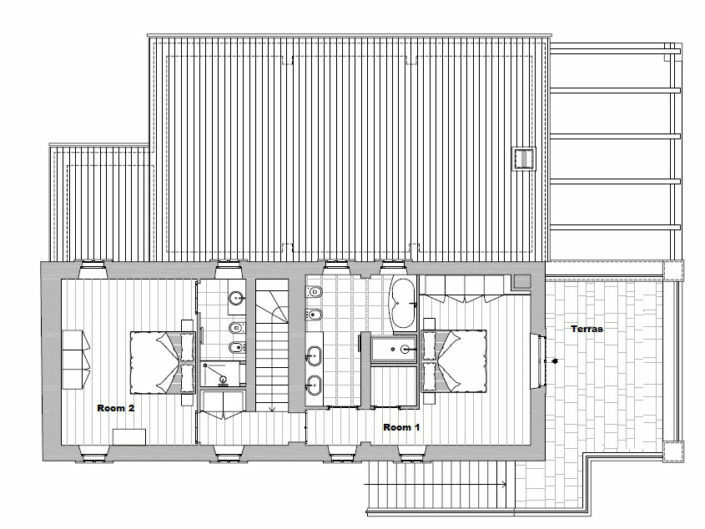 The first floor features the entrance hall that provides access to the lovely living room and the spacious kitchen, two bedrooms and two bathrooms (of which one en suite), a storage and a washing room, the nice portico as well as the pergola. The second floor accommodates two additional bedrooms, both of which dispose of en suite bathrooms, and a lovely terrace overlooking the southern countryside. The terrace can also be reached via a traditional outdoor staircase. 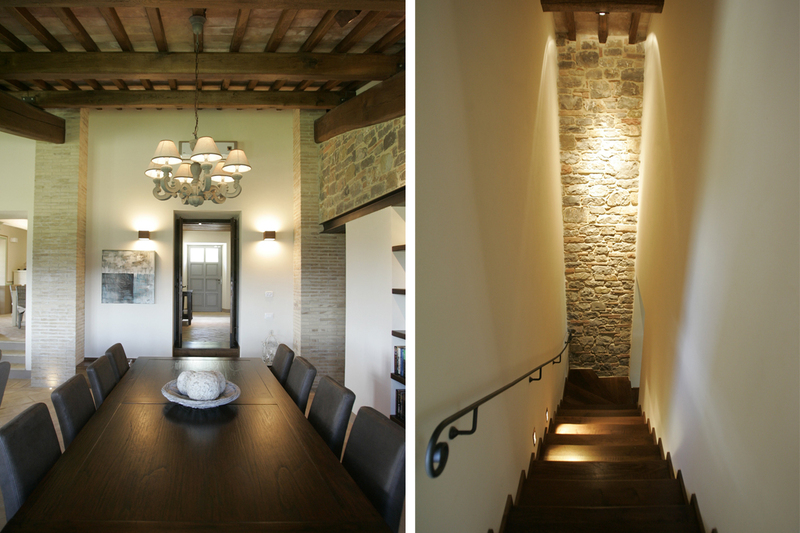 The wooden staircase taking you from the first to the second floor is decorated by an authentic Umbrian stone wall. A storage room is situated under the stairs. All rooms have large windows, allowing the sunshine to lighten up the whole house. Exception made for a number of windows with a grille in the living room, all windows have double-sided hatches and insect screens. 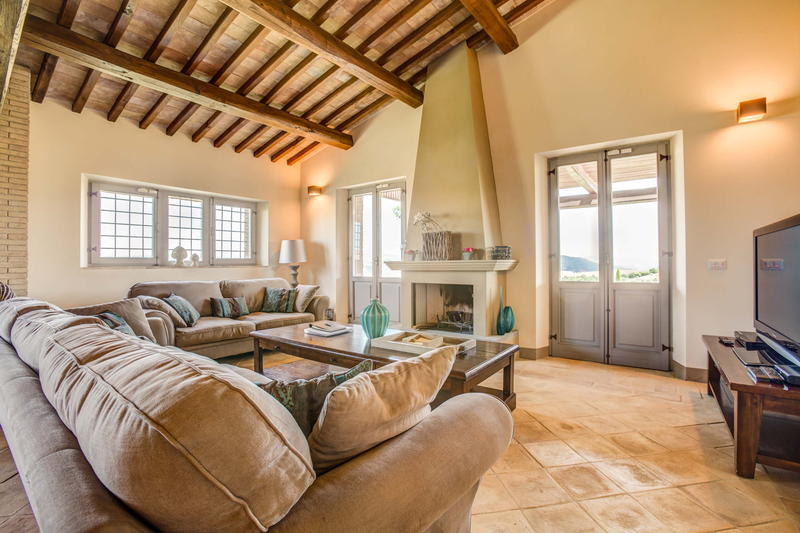 Casale Colline Dolci disposes of a fully integrated floor heating system while the whole house has also been equipped with airco, hereby ensuring a warm, cosy atmosphere in winter times as well as cool relaxation during high summer. The main entrance to the house is composed of a traditional, concrete wooden door which opens into the large entrance hall. The living room is situated at the end of the hall, just behind an original two-sided wooden door and a small staircase, taking you three steps down into the living room. The light, lovely living room has a surface of approximately 50 square meters and is furnished with a beautiful rural dining table, accommodating for up to 10 people, a cosy sitting area with two large sofas in front of a nice fireplace, a bookshelve built into a traditional Umbrian stone wall, two lovely cupboards and small decorative items throughout the whole room. A satellite-TV and DVD-player are available. 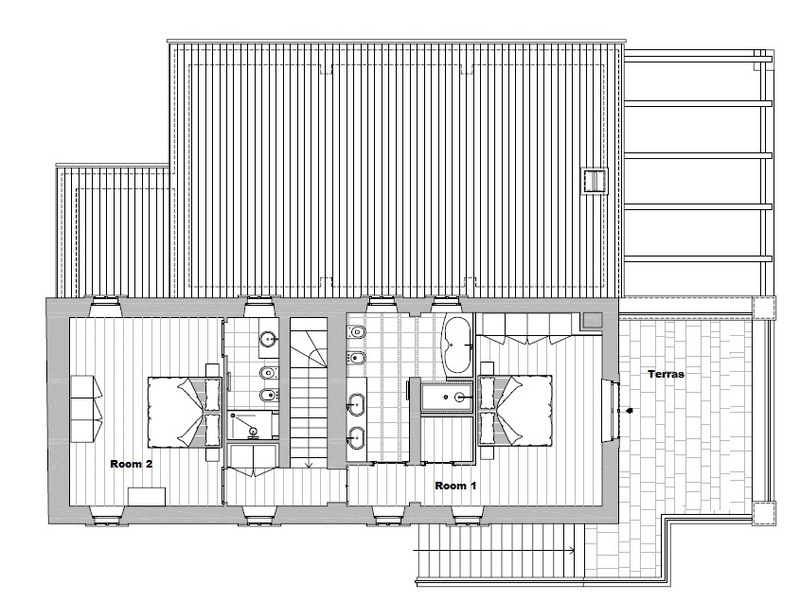 The living room provides direct access to the lounge pergola via two door windows. Just before entering the living room, to the right in the entrance hall, is the spacious and fully equipped, yet romantic, stylish and rural kitchen. The chestnut beams on the ceiling have all been painted in white, while the travertine stone counters, the large kitchen table, the chairs and the cupboards are all light beige, giving the kitchen a bright, lively and very pleasant atmosphere. The kitchen easily provides seating for 8 to 10 people and is equipped with all required modern material such as a gas cook top, an oven, a refrigerator with freezer, a dishwasher, toasters, etc. Next to the kitchen is a small washing room that contains the washing machine, the tumble dryer, the boiler, the drying-frame, various cleaning materials, etc. Two steps down, to the left of the portico, is the lounge pergola. This is truly an ideal spot to relax, have a glass of wine, read a good book, enjoy the sunset, admire the vineyards or simply have a talk with family and friends. 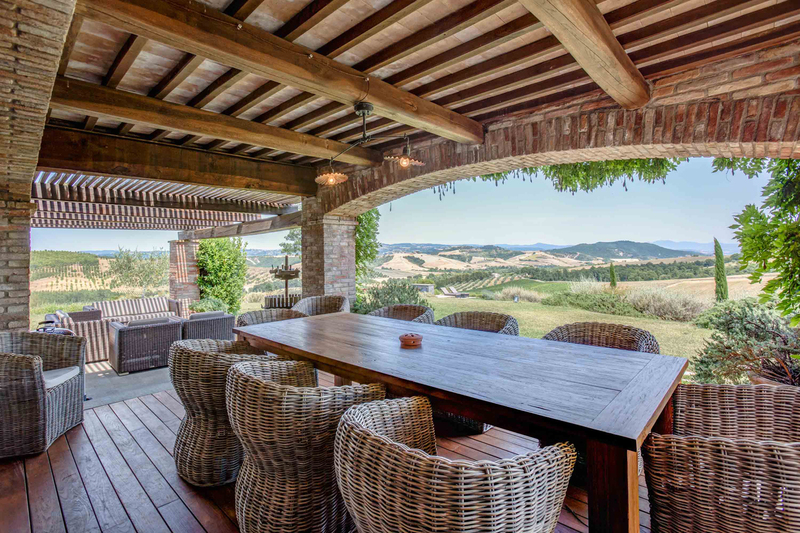 The pergola is partially covered with wooden laths, offering a combination of sunshine and shadow for those seated in the beautiful lounge chairs. 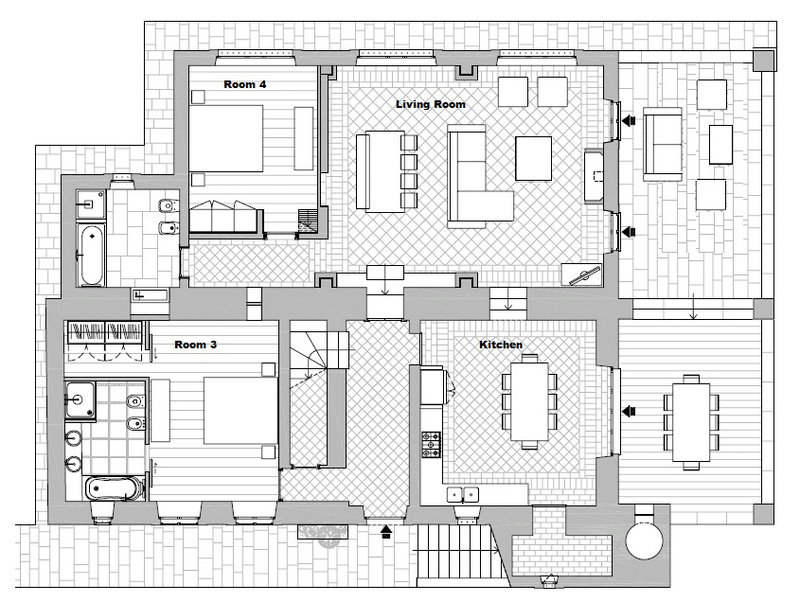 As stated before, there are two bedrooms on the first floor and two on the second floor. All bedrooms have been designed for comfort and austerity and they have been decorated in a pallet of straight colours like shades of light and dark brown, various taupe colours and straight white. The parquet floor, chestnut beams, the beds, traditional interior doors, cupboards and linen provide a unique combination of straight and simple colours. The beds are comfortable and large. The mattresses are durable, strong and solid and so is the bed linen. There is really no reason why anybody should not enjoy a refreshing and invigorating night’s sleep. 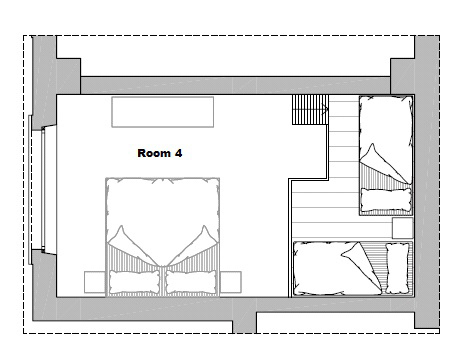 One of the bedrooms on the first floor also has an en suite wardroom, with plenty of space to store your clothes. 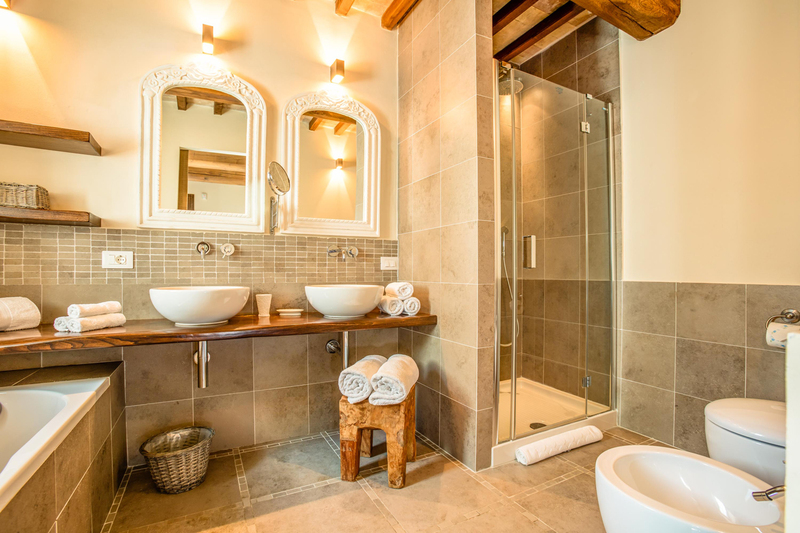 All the bathrooms are rural yet modern, spacious, beautifully yet simply decorated, light and truly functional. They all have a toilet and bidet; three out of the four bathrooms dispose of both a bath and shower, while two bathrooms have a double sink and two a single sink. 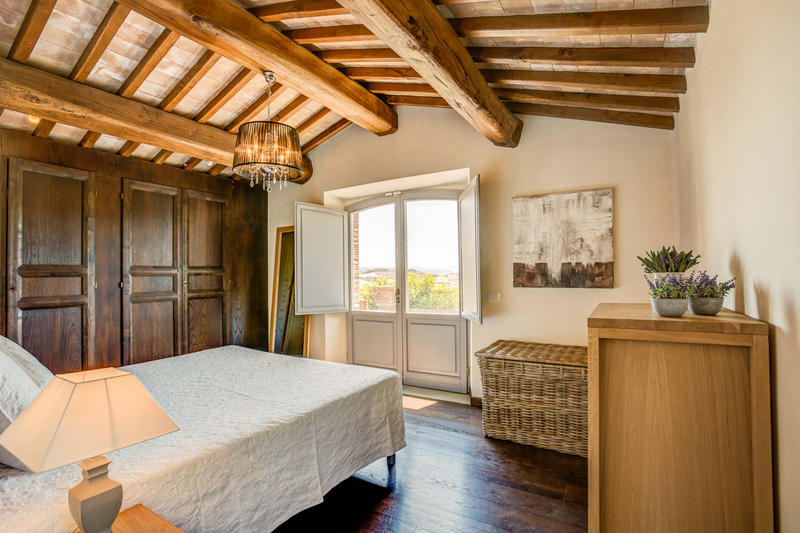 Casale Colline Dolci truly breathes the authenticity of Tuscany and Umbria, while offering all comfort and luxury that would even satisfy the most demanding guests.